The Cleantech Playground (CTP) is a testing ground for innovative clean technologies in the Amsterdam city center which aims to (biological) cycle closure. The concept is first realized at De Ceuvel, breeding ground for creative entrepreneurs. 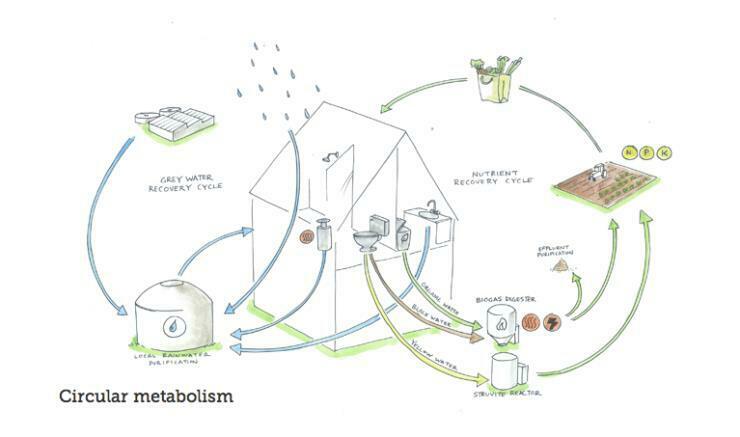 Food production (partly under glass) is combined with decentralized power generation, water treatment and processing of organic waste using innovative technology. De Ceuvel started in the spring of 2013. This is a temporary industrial area where offices are composed of recycled houseboats that are placed on land for a period of ten years. Currently the area is still supplied by the conventional centralized water supply system. 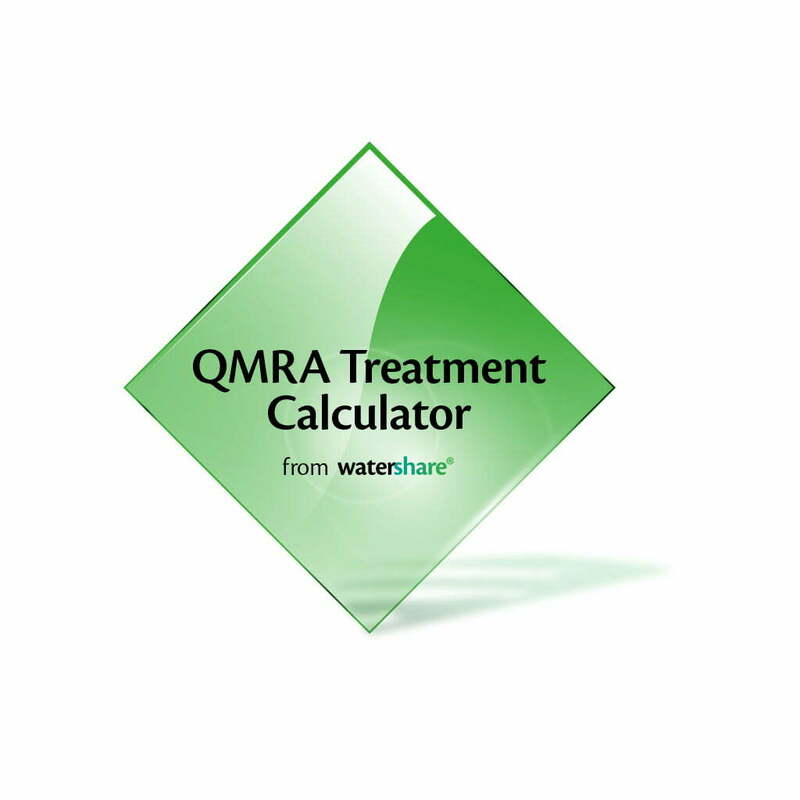 The QMRA Treatment calculator was used to evaluate the safety of three conceptual decentralised water supplies. At De Ceuvel, canal water, rainwater and grey water are potential water sources for local drinking water supply. Canal water is approximately the same quality as Rhine water. 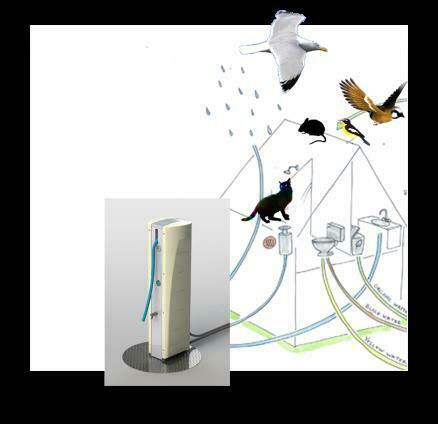 The conceptual treatment system consists of many steps including RO membrane filtration and UV light disinfection. This system can meet the health target if the processes are fully functional (7 infections per 10 million). This means that membranes and UV lamps are replaced regularly and functioning is monitored. Monitoring the full potential of these technologies is problematic however since even small leaks or failures can substantially compromise the performance. Detection of these small deviations require advanced sensors or substantial water quality analysis in a laboratory. These extra costs and efforts for performance monitoring need to be taken into account when evaluating the system, which can then achieve about 7 infections per 100,000. Rainwater contains few pathogens, but rainwater harvesting on rooftops includes the feces of birds and other animals that have access to the roof. Their feces can contain zoonotic pathogens that infect humans. Transmission of waterborne viruses is unlikely but bacteria and protozoa can be abundant. Treatment with only membrane filtration, such as the village pump, results in a slight non-compliance of 4 infections per 10,000 people from Campylobacter . However on the long term, due to limitations of integrity monitoring, the system could start leaking without detection, resulting in 3 infections per 10 people, which can be regarded an outbreak of waterborne disease. Grey water quality from kitchen sinks at De Ceuvel is hard to predict since it depends on the behavior of a small group of people on an individual house boat. A standard advanced home water treatment consisting of RO membrane filtration and UV disinfection could be installed per boat to recycle the water from the sink. 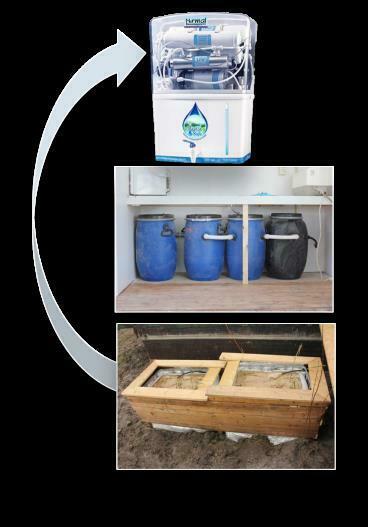 Again potentially this system produces water with a very low risk (4 infections per 10 million). However, also here monitoring long term performance is challenging. A long term risk estimate would be around 5 infections per 1,000, exceeding the target 50 times. The QMRA treatment calculator was used in these assessment to estimate the potential treatment efficacy, but also provided guidance on how to address issues of maintenance and monitoring needed to verify this in practice.